It’s been 25 years since Norway hosted what even the International Olympic Committee (IOC) boss at the time famously called “the best Olympic Winter Games ever.” The torch in Lillehammer has been re-lit for this week’s silver anniversary celebrations, but Norwegians themselves are far from fired up about mounting what they call “vinter-OL” for the third time. A new public opinion survey shows that only 36 percent of the Norwegian population supports hosting a new Winter Olympics. The survey, conducted by research firm Norstat for Norwegian Broadcasting (NRK), also showed that nearly as many (32 percent) are opposed and the remaining 32 percent are skeptical or unsure. Efforts by the City of Oslo to host another Winter Olympics in the capital in 2022 also fell flat a few years ago, as did a more recent effort in Telemark. Powerful forces within the Norwegian sports world are undaunted, however, and think the 32 percent who are undecided can be open to persuasion. “Norway needs to the highest possible degree a new OL,” Gerhard Heiberg told news bureau NTB this week. Heiberg is the former Norwegian business executive and longtime member of the IOC who was president of the Olympic Organizing Committee for the successful games in Lillehammer in 1994. “With a new OL, we can show once again how the Olympics can be reasonable and fantastic,” he said. His successor on the IOC, Kristin Kloster Aasen, agrees. Lillehammer’s Olympics, however, weren’t viewed as “reasonable” when they took place 25 years ago. There were major budget overruns just like there have been for most all Olympic organizers and goverment hosts. When compared to the extravagant amounts of money spent more recently, though, and not least by the Russians in Sochi in 2014, the costs amounted to “small change” in the view of Norwegian real estate developer Arthur Buchardt. He invested heavily in hotels and other projets in advance of the 1994 Games, and became one of Norway’s leading real estate tycoons. The IOC no longer demands they be as “compact” as they were in the Lillehammer region, however. That’s prompted athletics organizations in Oppland County (where Lillehammer is located) to team up with Hordaland, Trøndelag and Telemark counties to mount a proposal to host the Winter Olympics jointly in 2030. The leader of Norway’s national athletics organization, Tom Tvedt, supports the proposal. He’s enthusiastically nostalgic about the 1994 Olympics in his hometown, as are many others. NRK re-ran highlights from the Opening Ceremonies on national TV Tuesday night, just after the re-lighting of the torch by a 25-year-old local resident, Kristin Dahl Sørensen Dimitrova, who was born during them on February 12, 1994. She was named after one of the mascots from the 1994 Winter Games. 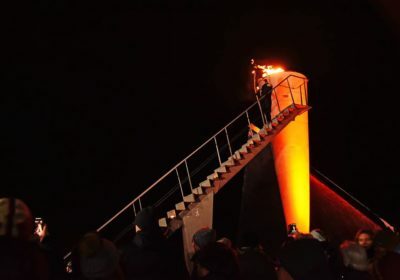 Lillehammer itself is hosting a week of anniversary events from the torch-re-lighting to a “Jubileum Conference” on Friday in which Heiberg, Aasen, local business officials, sports commentators and former gold-medal-winning athletes will participate. A new Norwegian film about polar explorer Roald Amundsen will also make its outdoor premier. 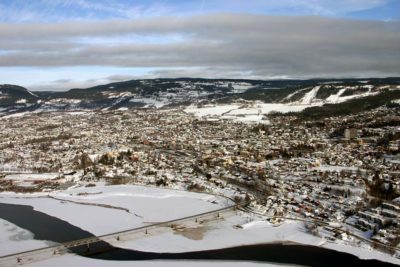 On Saturday, the city is inviting the public to an all-day folkefest (people’s party) that officials hope will recapture the crowds and spirit that pervaded Lillehammer when the Olympics were underway. Old posters from 1994 already line the main street known as Storgata, which was nicknamed Stågata (Standing street) because it was so packed with people and there was standing room only. Winter sports events are also on the program, along with a parade scheduled for 2pm that will feature music, costumes and uniforms from the 1994 games. 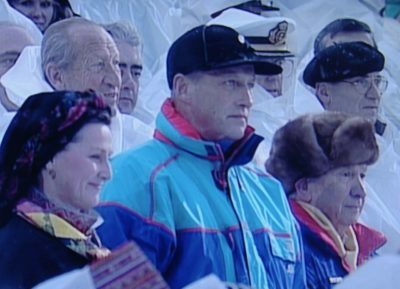 King Harald V and Queen Sonja, who presided over the Olympics, will also be present for the parade and other anniversary events on Saturday, which include torch-lit evening events back at the stadium and ski jumping hills were the opening ceremonies were held. That will be followed by a show inside Håkons Hall at 7pm, with the royals also in place. 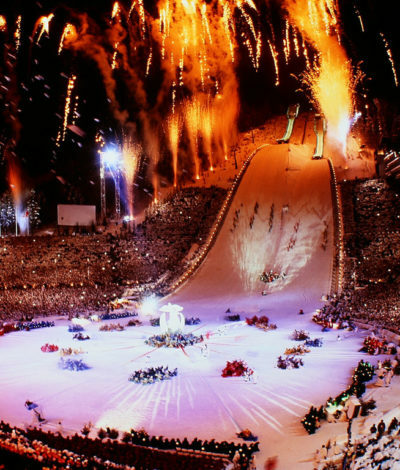 Organizers were hoping that especially those who volunteered at the 1994 Games will make their way back to Lillehammer.